A reccuring topic when I’m out lecturing about digital marketing and analytics is how to calculate Conversion Rate. It is a very straight forward calculation that you can apply to many metrics and different aspects of your business. I also fin that many small business owners don’t take their time to sit down and define their business objectives, strategies, tactics, KPI’s and targets. I get it. SMB’s does not have all time in the world and usually focus on short term activities, because it is a small business and with it comes small budgets, less employees and more. One thing that we all can agree on doing, as it does not take more than a few minutes, is to calculate our Conversion Rate and keep track of it over time. We need some kind of measurement to understand if we are improving or not. The Conversion Rate is the number of sales divided by the number of leads multiplied by 100. Straight forward and easy for all to use. And don’t get stuck with these examples. If you’re not selling products – count hours. Maybe you have billed 3 clients this week and you have 9 clients that call you for your expertise (which could be plumbing, designing prints, coding etc). Congratulations – your Conversion Rate is 33%. We all have to remind us from time to time that we measure, in order to improve. Take the number of sales divided with the number of users multiplied with 100. Ecommerce Conversion Rate is a bit tricky when you first look at it in Google Analytics. Ecommerce Conversion Rate in Google Analytics is currenlty the percentage of sessions that resulted in an e-commerce transaction. Ouch. Not all sessions (visits) have the intention to genererate a sale, right? This metrics should be calculated on a user level instead. Bare this in mind when you’re reporting Ecommerce Conversion Rate and any other metric for that instance. Always know the calculation behind the metric you’re using. This is why I love the Calculated Metrics feature in Google Analytics. One of my favorite calculations? Goal Completions divided by Users. No more counting sessions. Using Google Analytics? 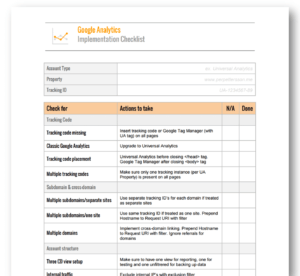 Get your hands on my Google Analytics Implementation Checklist, for free. Download it, print it, follow all the steps and make sure you have a solid Google Analytics implementation.